Choose from eight different Best Management Practices to install on your property and submit an application for an opportunity to reduce your Watershed Protection Fee and/or be reimbursed for your projects. The reimbursement is a one-time payment for installing a CleanScape practice, and credit is an annual percentage (based upon the impervious that has been treated by your practice) towards your Watershed Protection Fee. All practices are eligible for reimbursement and credit--however your practice must meet the minimum requirements. Use our CleanScapes Program Guide, for detailed information about each practice, as well as minimum levels for credit and reimbursement for each practice. 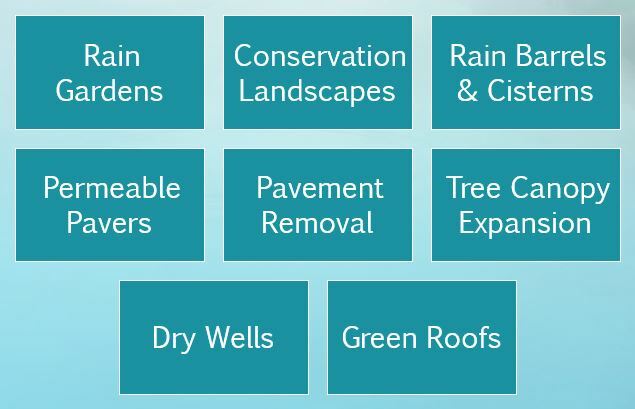 Our Eco Friendly Gardening Cheat Sheet is a list of resources available to help you, including local contractors, financial resources, and site assessments. If you are interested in doing a project yourself, take a look at our Green Registry for local stores that carry native plants and materials for projects. Participate in our Native Plant Passport to recieve a coupon sheet offering discounts to local nurseries and garden supply stores. The Native Plant Passport was created by a River Hill High School student intern. Pictures of example practices are at the bottom of this page. You can also check out this video to see how installing a CleanScape saved a Howard County homeowner's yard from stormwater runoff. During your project, keep all of your information in these cheat sheets (see below) —or ask your landscaper to fill them out, so you can easily submit this information with your application. **Please note** If the contractor you choose has installed less than 5 CleanScapes practices through this program, we will require these additional documents: planting plan (if applicable), profile view of practice (detailing soil amendments, depths, etc. ), and calculations or observations justifying design. Complete the application for a CleanScapes Reimbursement and credit and fill out the corresponding info sheet. You must apply for credit by April 1, 2019 to be considered for credit against the July 2019 Watershed Protection Fee. An inspection will take place on your property to ensure your practice meets the minimum requirements. You will be given at least 48 hours advance notice and do not need to be present for the visit, although you may join the inspectors to provide more information during the site visit if you wish. Information collected during the site visit, along with the initial application, will be reviewed by staff to determine the final award of credit or reimbursement. Inspections are performed on a rolling basis from Spring to Fall. We cannot grant credit or reimbursement for structural BMPs installed at the time of development. These items are required by development regulations. You have a rain garden, but how can you keep it gorgeous for years to come? Find information from local experts offered at a recent event here!